My ideas on electric driving haven’t changed a lot since I first drove an electric car. The torque being instantly available is very pleasant. Also the Energy regeneration which slows you down when you release the throttle makes it very fun to drive an electric car. It allows you to drive only using your throttle, which is called ‘one pedal driving’. Very relaxing in traffic jams. Not having to refuel is also a big plus. You just plug into your charging station when arriving home, and your car is full in the morning. Hard to think I once worried if I’d make it home without refueling. 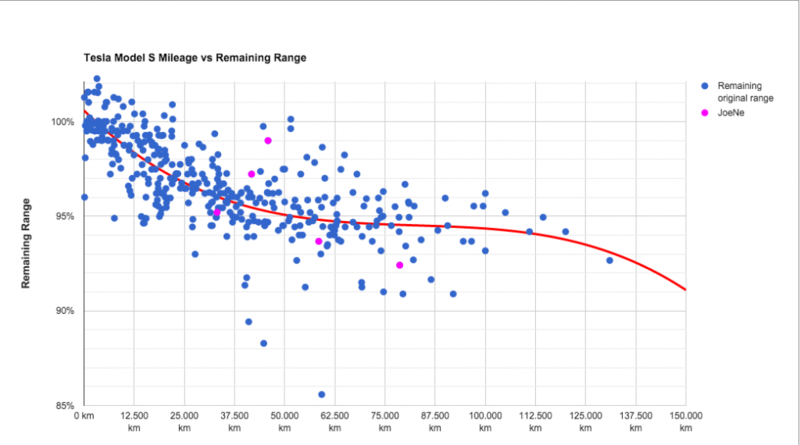 There was an initiative on the Tesla Motors Club Forum to log our remaining range during time. Here are my figures highlighted. The 2 peaks you see where registered when I had a loaner battery in my car. As you can see I’m absolutely not the best in class. I have about 92% of my original battery capacity available. I’ve always charged my battery up to 75%, and did this daily. I will now change this and charge to 90% and do it every 2 days, hoping I might normalize my degradation a bit. We’ll see how this evolves. In those 2 years my car has had its issues. But that’s what I expected driving a semi-prototype car. I have one of the early European production models. All these things were done under warranty, and most of the repairs were initiated by Tesla themselves. I never asked for a drivetrain replacement, but they thought it made too much noise. Same for the battery heater. They noticed a malfunctioning during maintenance service and replaced it. For the 12V problem an error message popped up to contact the service center. It was replaced in an hour or so. The main battery was replaced after I got stuck on my driveway. The car wouldn’t start anymore. 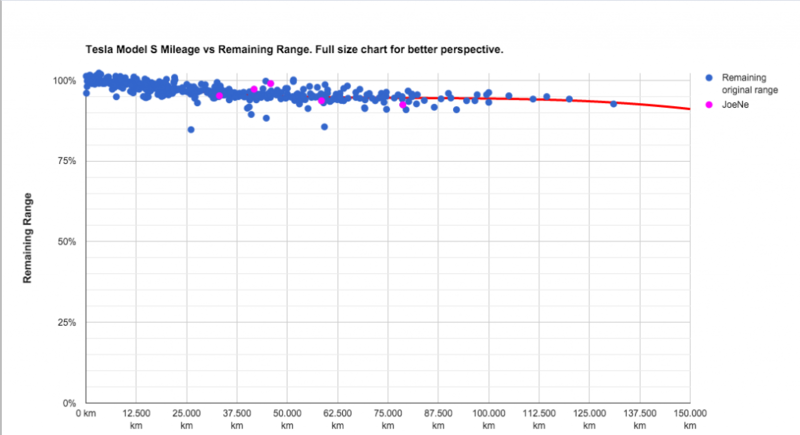 Tesla provided a replacement Tesla and found the battery problem. They fitted a loaner battery, and after a couple of months I got my original battery back, and never had a problem since. The USB port was still functioning, but the black spacer inside the port was loose. In short I am very happy with their service, but I know this was part of their warranty. This warranty just ended, so next time my battery heater goes, I’ll have to pay it myself. But that looks only fair to me. has been continued. People using my link can also use my gear (CHAdeMO charger, Roof bars, Juice Booster, Ratio Charger) when needed. Uptill now there were 2 people using my link. Hereby thanks to do those 2. If anyone else uses my link, feel free to contact me.